An abroad based “professional critic and analyst” whom may be really nice but not sure ‘where she going with this’ by insulting/praising Nigerian celebrities has been called out by blogger Stella Dimoko Korkus for an alleged interview. Mary Jane is resiliant despite the abuse she receives from followers for “exposing” stars including Toke Makinwa but also praise other celebrities she likes! The best has to be the war of words between her and her fellow/nemesis – Kemi Olunloyo – oh Insta Insta. 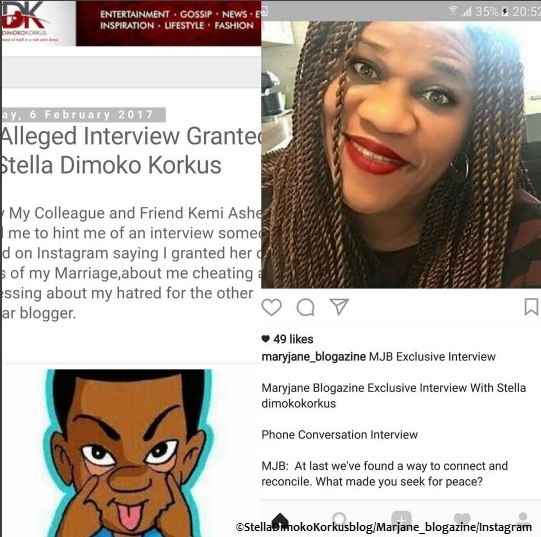 UK Nigerian, Worldwide "On alleged interview granted by Stella Dimoko Korkus" to Mary Jane's blogazine Bookmark the permalink.